The island's only Anglican church is St Anne's situated on a hill between Victoria Street and La Vallee. This 32 metre high lighthouse on the east coast is a spectacular and famous land mark at Quesnard point. Its beam of four flashes every 15 seconds can be seen 23 sea miles away but is no longer manned. It became fully automated in 1997 and is now operated by the Trinity House Operational Control Centre at Harwich in Essex. Conducted tours of the lighthouse are available in the summer on Friday, Saturday and Sundays at 2.30pm and 3.30, or by appointment for groups of eight or more. Offshore Angling provides charter for all types of angling and charter using 'Alderney Felix', a 35foot Offshore Pro Charter vessel based in Alderney harbour. She has been custom built with safety, comfort , and angling high on the agenda, and is licensed to operate up to sixty miles offshore (CAT 2). She carries state of the art electronics. She is fully insured and skippered by a fully licensed skipper/owner who has been fishing around Alderney for over thirty five years. Situated in Victoria Street, the Alderney Cinema shows the latest film releases and is supported by the Alderney Cinema Club. The reel has to be changed at half time but the audience retires to the pub. One can find details of the films currently showing on posters throughout the island. Located inside the Island Hall and open every weekday, this excellent and extensive library, run by dedicated volunteers, provides a service for islanders and visitors. You will be asked to pay a deposit which is refunded on return of all borrowed books. See the potters at work and then browse through the shop where you will find a wide range of hand made pottery plus various other souvenirs and toys. One is You are quite welcome to browse. Open weekdays 9.00am to 5.00pm and 9.00am to 1.00pm on Saturday. Alderney has the only railway in the Channel Islands, thanks to the support and enthusiasm of volunteers . The "Orient Express" opened by Queen Victoria and Price Albert celebrated its 150th birthday in 1997 and attracts enthusiasts from all over the World. It runs from the harbour up to the north-east coast and back again. The railway line was inaugurated by Queen Victoria and Prince Albert. 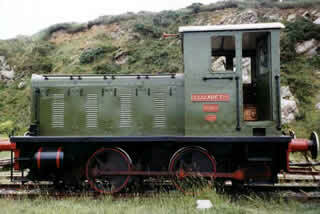 The diesel engine pulls former London Underground carriages built in 1938 along a scenic coastal route before cutting across country towards Mannez Quarry and the nearby Mannez Lighthouse. In 2000, 2,700 passengers were carried. Two newer London Underground aluminium carriages built in 1959 have been bought and in 2001 replaced the older ones. This train and the little Wickhams can also be chartered. For bookings call : +44 (0)1481 824385. The museum was opened in 1966 and is run by volunteers. It gives a unique insight into Alderney's fascinating history from Neolithic times to the modern technological age of the 21st century. Among the items worth seeing are artefacts from the shipwrecks around the island including a cannon and muskets from an Elizabethan warship discovered less than a mile off the island's north-east coast.